Startastic™ | The fast, easy & beautiful way to light up your entire house! The fast, easy & beautiful way to light up your entire house! The magic is in our powerful laser light system that projects beautiful holographic stars up to 600 squared feet. Creating an amazing 3D light show! Fill out the form below to order your Startastic™ now! 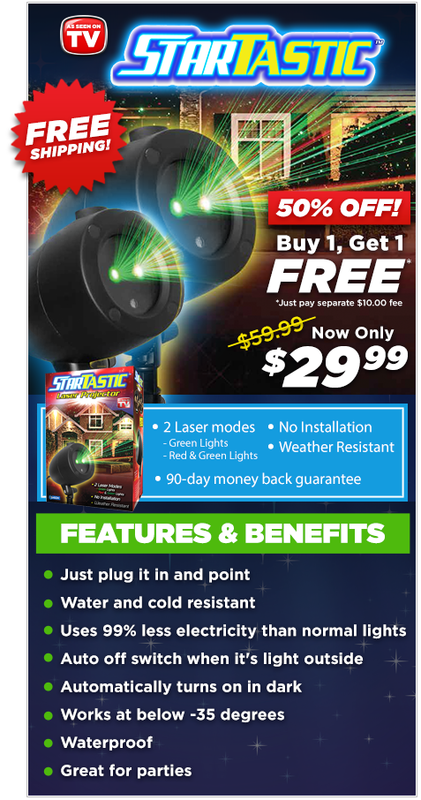 Upgrade my order to the Shooting Star Motion System for just $10 per Startastic™! Buy the Startastic™ today for just $29.99 & we'll send you one free, just pay a separate $10.00 fee. Each order comes with a 90 day Money Back Guarantee + FREE shipping! Sales tax will be applied to all orders from CA, NJ, NY & NV. A $10 shipping surcharge will be applied to orders from AK/HI. A $20 shipping surcharge will be applied to orders from Puerto Rico. You may also call 1-800-417-6125 to place an order. ©2019 Startastic™ All Rights Reserved.